First of all, we rode on public transportation during our time in China and Tibet. 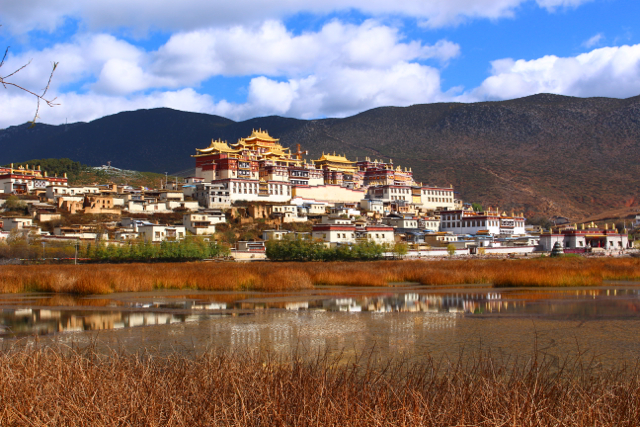 This definitely created some interesting situations along the way but one of the best occurred when we were driving to Shangri La, Tibet, also known as Jong Dian, by the Chinese. 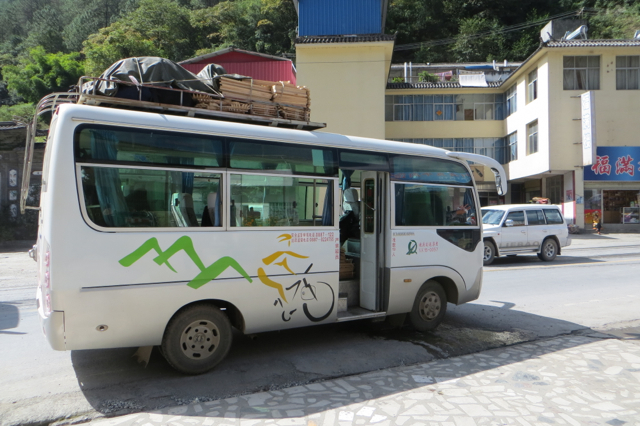 The road to Shangri La is steep and winding and our 19-passenger bus began to overheat. The buses engine is accessed inside the bus so our bus driver, a real intelligent fellow, decided to pull over, leave the over heating engine running, open the engine compartment and then open the radiator! This resulted in a geyser of radiator fluid shooting to the ceiling of the bus and then the entire bus filling up with smoke. I had to open the window and hang my head outside to breathe until I could get off the bus. 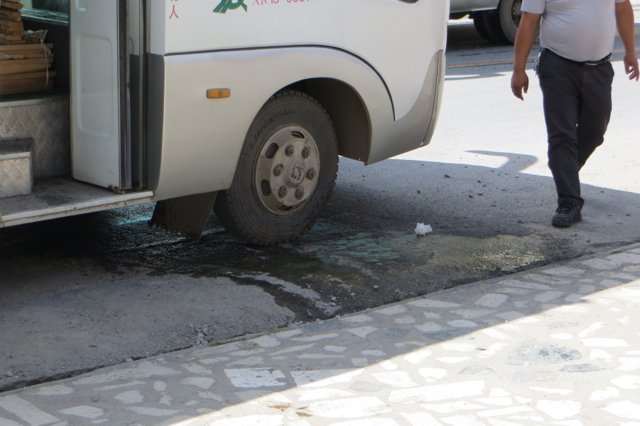 We then all stood there on the side of the road being doused by black engine exhaust from every truck that drove by and looking at our bus thinking, China is awesome. 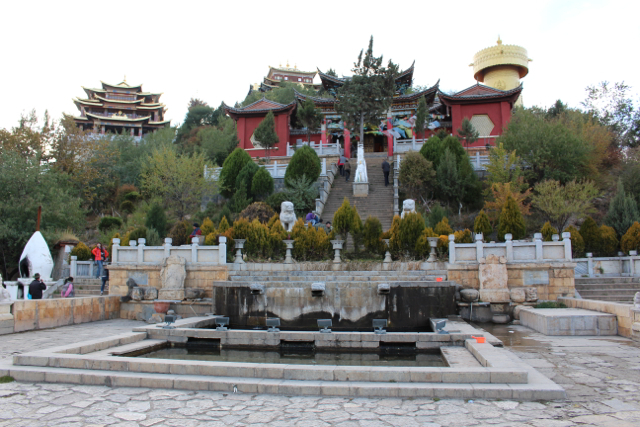 We did eventually get to Shangri La, and as we got closer I began to realize that there were a more than a few things that made this area unique from any other part of the Yunnan we had been to. The architecture, agriculture and farming techniques as well as crops were completely different, and the people dressed differently and even looked different from the Chinese. 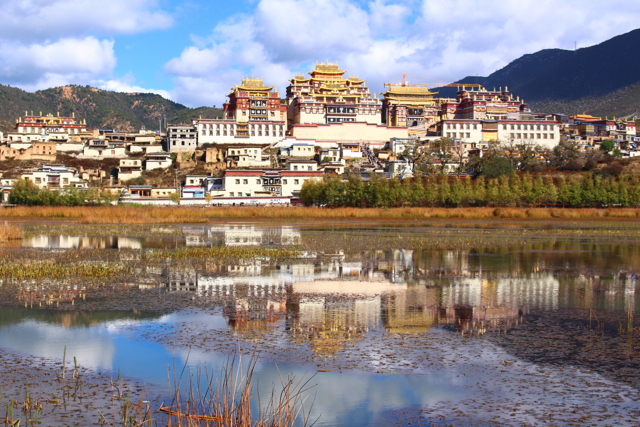 It is for these reasons, and more that I will discuss later in this blog, that I will refer to Shangri La as Tibet and not China. These were Tibetan people and I believe Tibet should be its own free country. When we arrived to Shangri La, the detail of the buildings was gorgeous with intricate wooden carvings on the door and window frames. 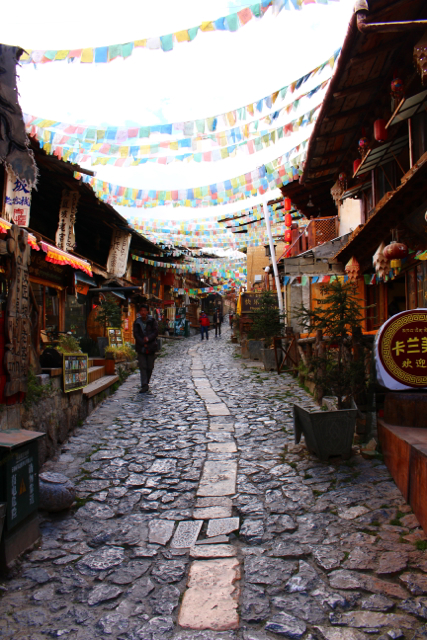 Prayer flags hung from one side of the street to another and snow-capped mountain peaks rose above the town. I had a peaceful feeling in my chest walking the cobble stone streets. 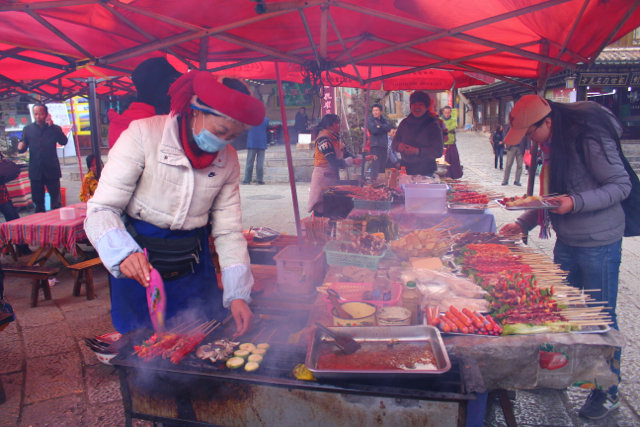 When we were exploring the Old City, which isn’t all that big, we went to one of the squares and had some street food. We learned that eating street food doesn’t have to be a gamble if you take some time and look for the right place. 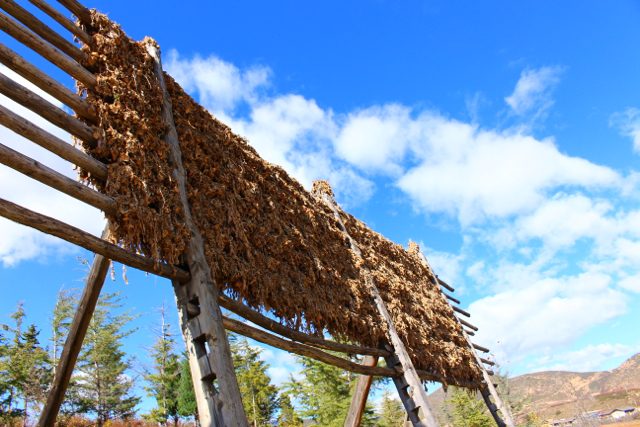 Step One: Look to see where the locals eat. Step Two: See what they are ordering. Step Three: Check that the meat is fresh in color and not so covered in seasoning that you can’t tell for sure. Step Five: Delicious success. 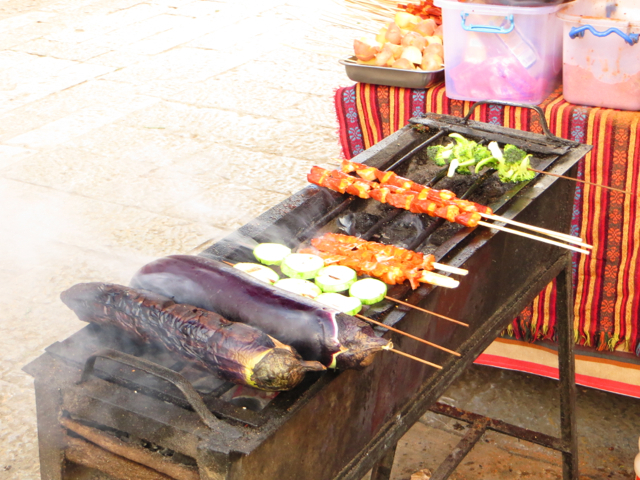 Enjoy eating an incredible grilled Yak skewer and roasted spicy eggplant, all for under $3 USD. It was our first time eating Yak meat but it most certainly wasn’t our last because it had a wonderful, slightly gamey flavor that we really enjoyed. 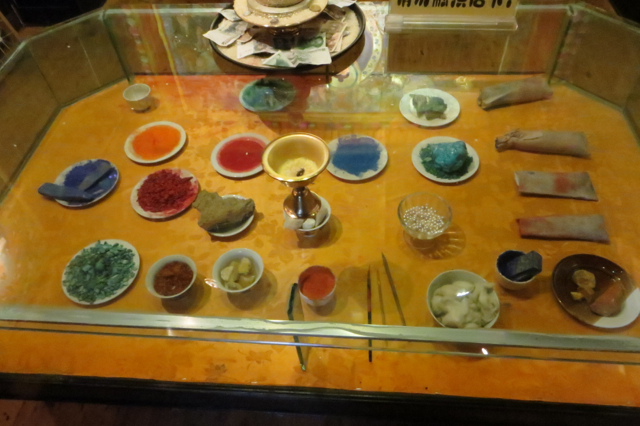 As we were wandering through looking at the art, a young man, probably in his early twenties, was trying to help us. 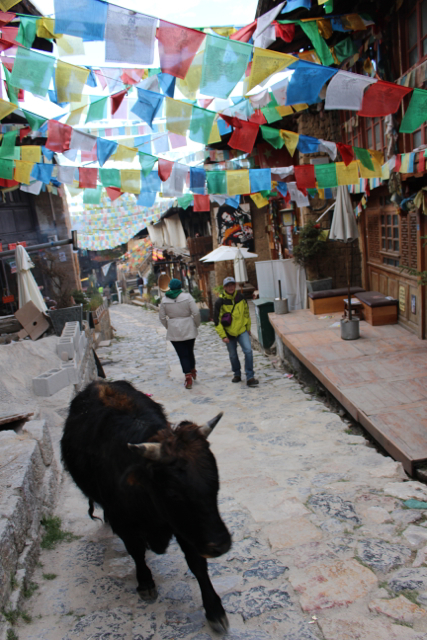 Unfortunately, he spoke very little English and we speak no Tibetan so the communication between us was poor. Somehow he knew that we were really loving the intricacy and beauty of the Thangkas so he took us into a back room that had the larger, more expensive, and impressive Thangkas. When we first walked in our jaws dropped to the floor. The paintings were so detailed and beautiful, unlike anything I have ever seen before. 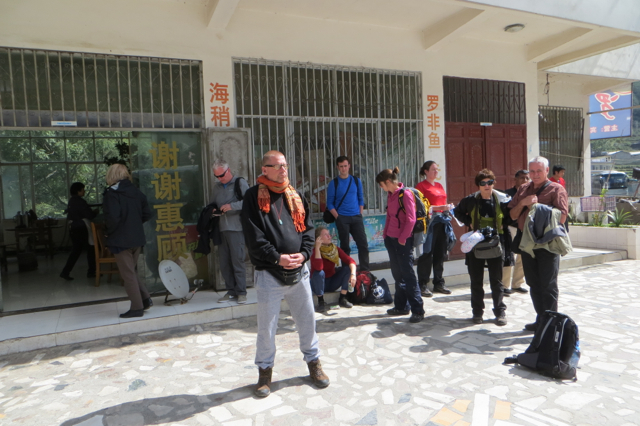 Luckily, while we were wide-eyed looking at the paintings, the manager of the gallery, Kelsang, arrived and his English was much better. We were able to ask a ton of questions and learn about the paintings, his story, and the gallery. 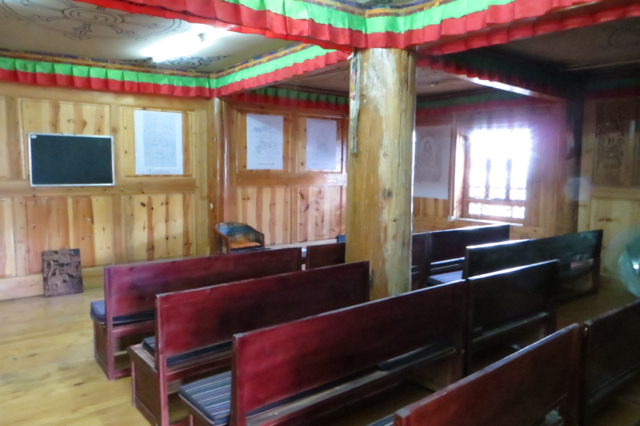 It turned out that this wasn’t just a gallery but also a Thangka school and a school for teaching the Tibetan language. 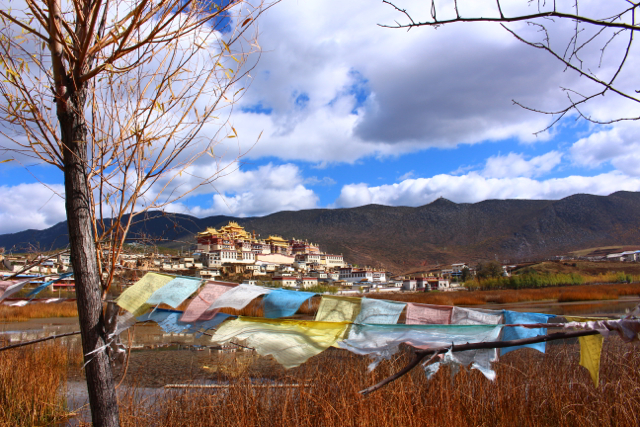 Kelsang opened this school in Shangri La because he saw a need to re-infuse the community with their Tibetan heritage. This is a risky and incredible undertaking and I will always be impressed with his dedication to this project, in spite of the Chinese governments distaste for anything Tibetan. Many Thangkas that you can buy are made using artificial paints, at Shangri La Tibetan Thangka Painting Center Gallery, they only use natural colors, grinding turquoise to make blue, pearls for white, and of course actual 24 carat gold for the details in the paintings. We also learned that he is Thangka Master painter, he was sent to learn from the Tibetan Buddhist monks when he was 3 years old and studied Thangka for ten years. He then travelled with his father, who is also a Thangka painter, painting for monasteries throughout Tibet. 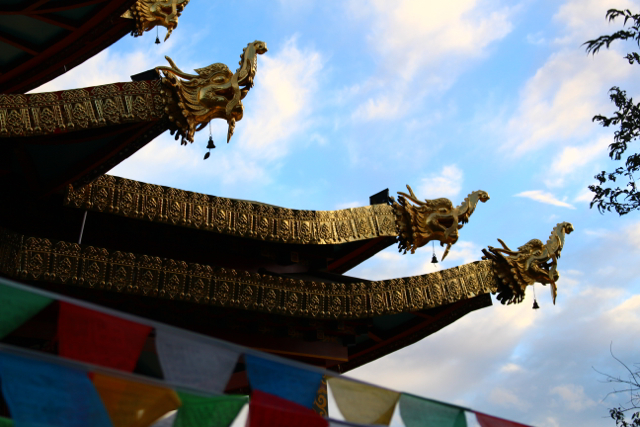 Later in life, Kelsang travelled to India where he studied Buddhism and English for five years before coming back to Shangri La and opening the School and Gallery. 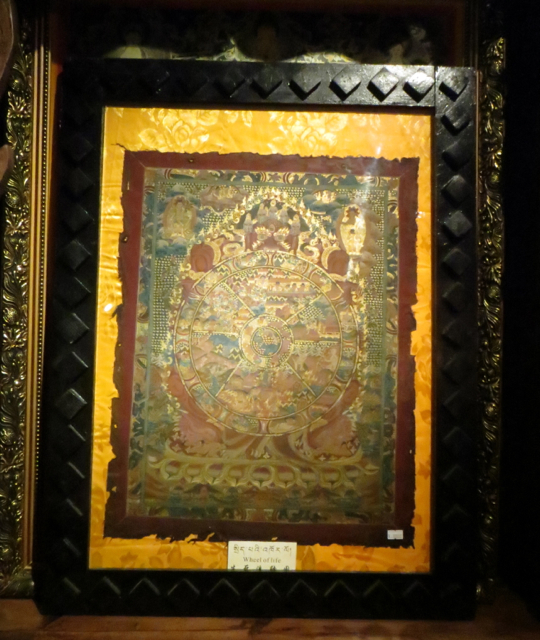 As he was talking, a noticed a Thangka that was framed and leaning against the wall, it was almost like I had been called to by it because it ended up being an incredible piece of art, with a story that we won’t ever forget. The Thangka was painted 80-100 years ago by a monk and was torn down from inside a monastery during the Chinese revolution and hidden in a wall by a monk while the Chinese destroyed the Tibetan Monasteries. 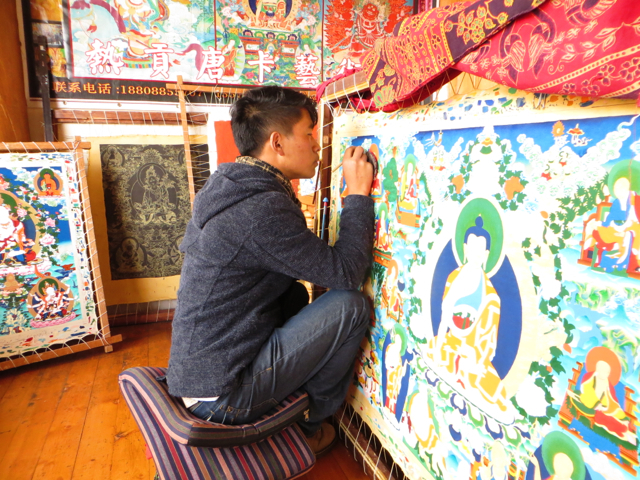 It was given to Kelsang when he was working as a Thangka painter at a monastery in exchange for his work. 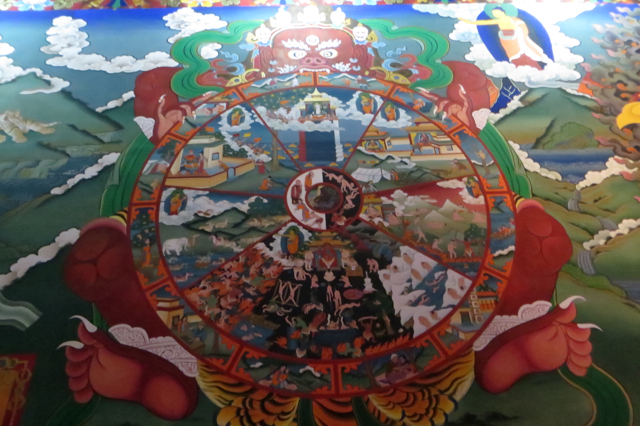 We fell in love with this Thangka that represents the Wheel of Life but due to the price tag, we weren’t sure if we should purchase it. Kelsang suggested we come back the next afternoon, which was a holy day for Tibetan Buddhists because Buddha was coming to Earth that day, and have some tea. We of course did just that and we ended up buying the Thangka. He never once pushed us or even asked us if we wanted to buy anything, he was happy just to talk and share the story of his journey with us. 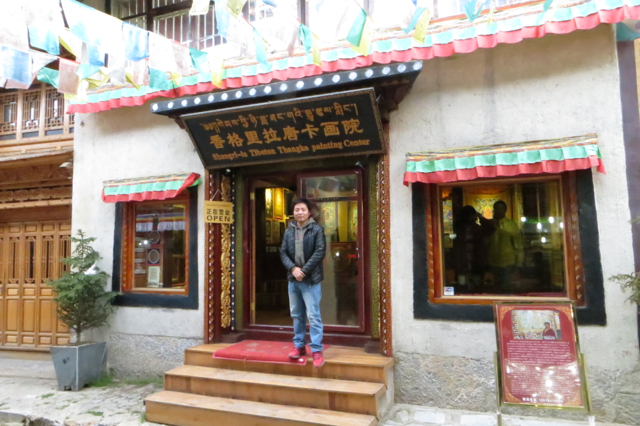 The entire experience at the Shangri La Tibetan Thangka Painting Center Gallery is one that I will never forget and I feel incredibly lucky to have wandered in and met a brave man who was working hard to make his roots stand firmly in a fire of Chinese hatred. 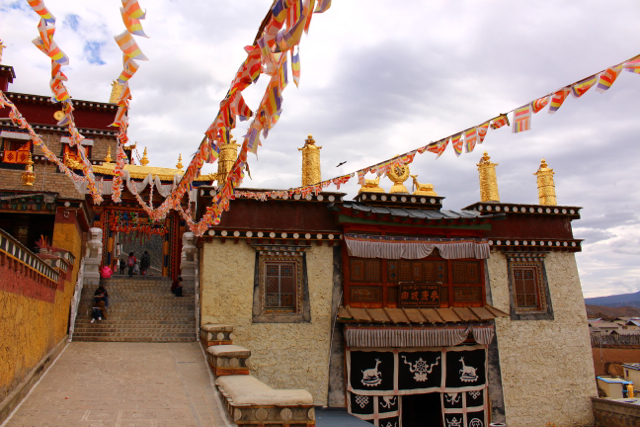 While in Shangri La, we also were able to visit the Songzanlin Monastery. 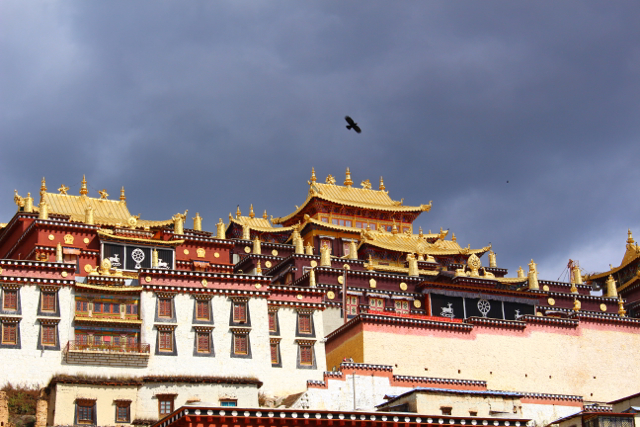 The walled commune is actually home to eight different monasteries that vary in size and importance. 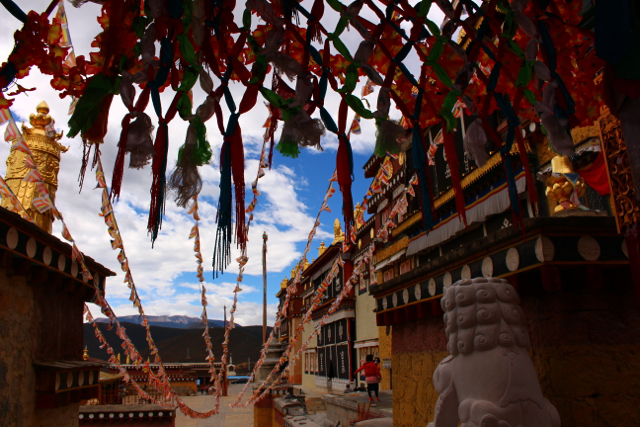 The monasteries were impressive, standing on a hilltop above a lake surrounded by prayer flags. 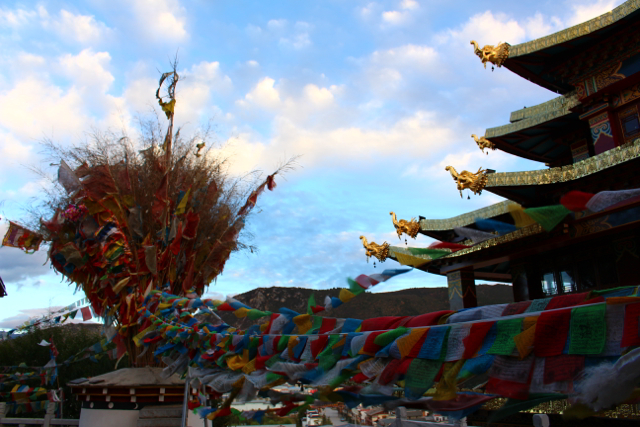 The prayer flags have the mantras written on them so once you hang the flags, then each time the wind blows, a prayer has been said. 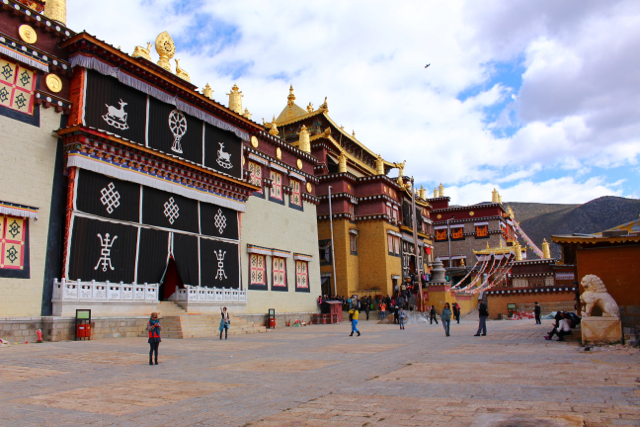 When we were walking around the monasteries we could see Thangkas painted on the walls inside. Some of them were the Wheel of Life, the same one we had purchased. It was a special feeling to see it on an entire wall inside of a monastery. Our last night in Shangri La, we ate a delicious meal of Yak curry and then went to another monastery near the Old City. 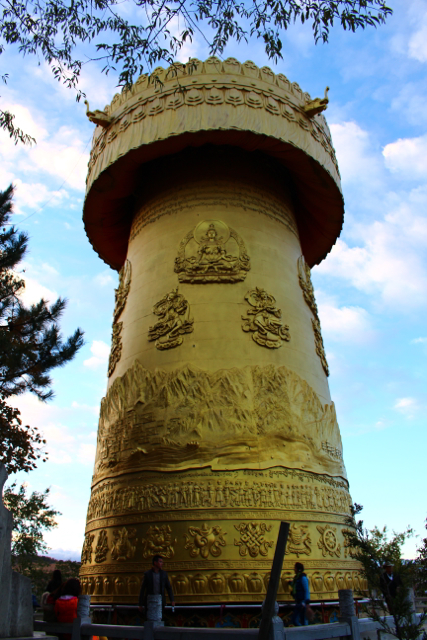 This monastery is much smaller than the main one but has the largest prayer wheel in the world. 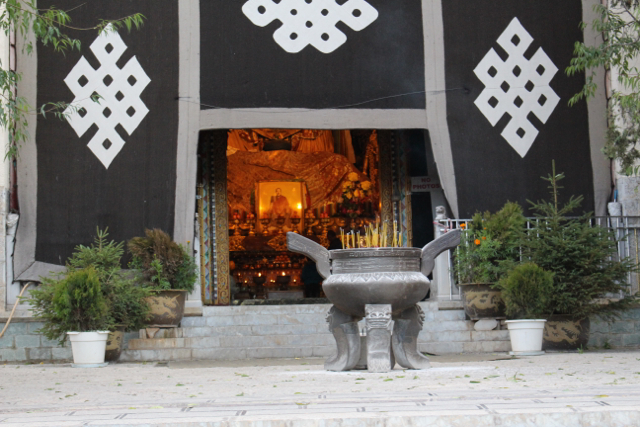 When we were walking through the monastery, a monk handed each of us incense and had us light it and walk clockwise around the inside before placing it outside with a large collection of other burning incense sticks. After we left the monastery, we walked down to the square, which had a large collection of local women dancing. I tried joining in for a few songs but I definitely didn’t have the groove so I let them do their thing and just enjoyed watching them instead. 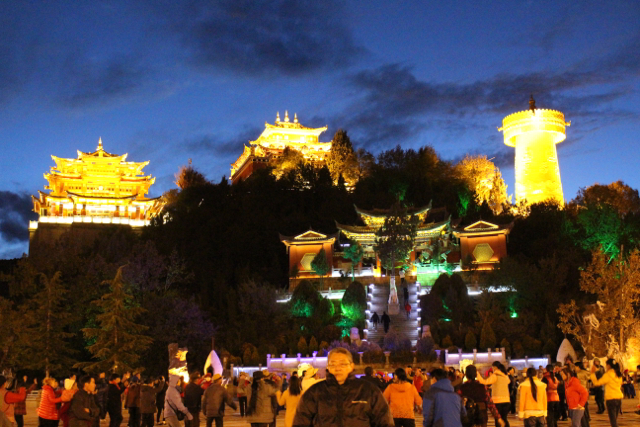 While we were watching them dance, the lights to the monastery turned on. It was beautiful all lite up above the square. Our time in Shangri La was incredible. We would have liked to spend several more days soaking up the peaceful atmosphere but we had to leave to start our trek through the Tiger Leaping Gorge, the deepest gorge in the world cut by the raging Yangtze River. This blog is so educational and an inspiration to me!! luv it!! I agree! I actually took the time to learn more about the “Wheel of Life” – A fascinating read. The symbolism depicted by the images is so relevant to our human/spiritual experience here on earth (suffering/salvation). Simplicity and enlightenment all rapped into a gorgeous painting. Thanks for exposing us to the Tibetan/Buddhist perspective!